Grahaeme Henderson, Shell’s vice president of shipping and maritime, last night unveiled a new initiative called HiLo that uses big data and predictive analytics to prevent accidents. The announcement was made at the UK Chamber of Shipping’s annual dinner in London. As well as Shell, big names such as Maersk and Lloyd’s Register, have signed up to the HiLo project, an abbreviation for High Impact Low Frequency. Henderson, who is also president of the UK Chamber, said HiLo, which takes ship data to identify possible safety faults, is already used successfully in other industries including rail, aviation and nuclear. “Our shipping industry has an accident rate five times that of the average British worker… Simply put, that is unacceptable,” Henderson said while introducing the project. The predictive, modelling system uses pre-cursor incident data to predict and prevent future major incidents. “Never again will a child lose a father or mother [at sea]… The time for rhetoric is over. The time for action is now,” Henderson concluded. 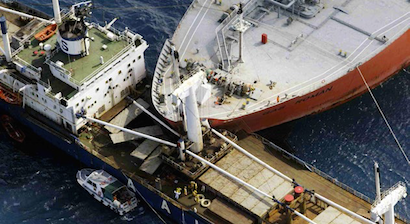 The shipping industry has very poor training standards and even poorer maintenance standards. Where does Mr Henderson intend to start? Somehow we don’t think that “big data” is going to provide us with the answer. “Better motivated people” would be a more practical place to start. It’s a good initiative. Big data might throw some useful info and help company or industry level entities to develop strategies to minimise accidents. But it will not be a silver bullet- no strategy ever is. I support the plan- is better than doing nothing about it. I’ve shared some ideas to reduce accidents through my book Golden Stripes- Leadership on the High Seas. Different initiatives from various industry professionals will all help in making incremental changes to safety standards in shipping. Every step is welcome. Accident rate five times that of the average British worker. Well, bring back the British seamen. Graheame Henderson needs to know, hus staff has little preparation or instruccion oi maybe it is poorly paid. If your accident level es high, it is for reasons of human failure, therefore you sould worry about that and not about rules that hinder the work on board. I think that Graheame Hernderson does not know his work when making such a statement that shows his total lack of knowledge about the case.